Logitech upgraded their older Z623 speaker to feature an optical port and branded it the Z625. The optical port opens up a wider array of connectivity options such as the ability to hook them up to a TV or Console directly. While these speakers are perfect for movie watching and casual gaming, their ability to belt out good music was surprising to say the least. The official (MRP) price tag on the Logitech Z625 is high, but their street price is considerably lower – anywhere between Rs. 7500 to Rs. 8999. At that price range you’d be hard pressed to find a better sounding 2.1 system. Let’s face it, good desktop 2.1 speakers are quite difficult to come by. So when a particular speaker system starts generating positive buzz, especially for being gaming and console focused, we can’t help but be curious. The Logitech Z625, as it turns out, is the updated version of its predecessor – the now good old Z623. By updated, we mean that it’s mostly the exact same speaker, except for the one important addition of an optical input. The optical input might not sound like a big deal, at least not as much as warranting a new SKU, but the fact is, it greatly expands the use case scenarios for these speakers. With one seemingly innocuous addition, your console or your TV can be connected to it via a more efficient, and usually higher quality connectivity mechanism. If you are keen to find out how they sound, the one word answer is “great”. Of course, the more nuanced answer is below for those who want more than the tl;dr version. But first, let’s start with what meets the eye. 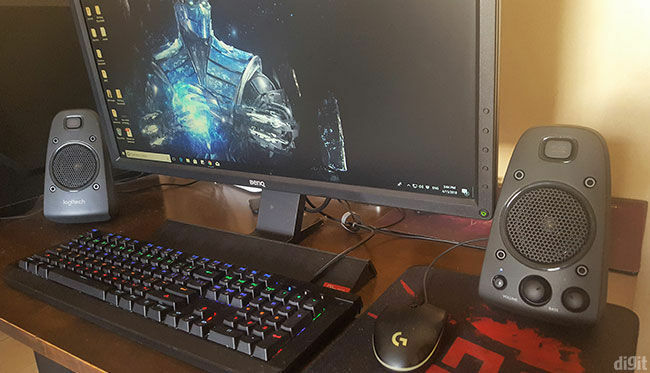 The stereo separation on the Z625 is good enough for detecting enemy positions while gaming. The speaker system being in the 2.1 configuration consists of two satellite speakers connected to a rather bulky subwoofer. The chunky matte black aesthetic which guides the speaker’s design language is quite nice to look at. The grilles on both the satellite units as well as the subwoofer nicely complement the design. It’s not a dainty speaker system, and it makes no pretensions about being so. The satellite units are almost 8-inches tall, so they are not going to be unobtrusive or inconspicuous. The right unit carries all the controls – a volume and bass level dial and a power on/off button. There’s also an aux in on the side along with a headphone out. Both satellite units connect to the subwoofer directly but the right one, with all its controls, has a very thick cable which terminates in a VGA type connector at the subwoofer end. It seems like there is a small horn tweeter underneath the THX logo but that’s just an aesthetic design. The satellites carry only one full range driver each. The driver housing seems solid enough, and the dials feel sturdy. The volume dial on our unit had a bit of a tight feel till about the 30 percent mark, after which it freed up. We’re not sure if this is a design feature aimed towards better control at low volumes or the dial was damaged in transport. Either way, it didn’t affect playback negatively. The base of the satellite unit has anti-slip rubberised feet and the units are heavy enough not to topple over easily. Similarly, the subwoofer isn’t lightweight either. All three components of this 2.1 speaker system feel like they mean business. Despite the crappy photograph, the matte black finish looks quite good in person. You'll just have to take our word for it. One of the biggest “features” in the Z625, is the inclusion of an optical input. This greatly enhances the ways in which you can use these 2.1 speakers. Not only is optical a better quality connectivity option, but also since many TVs today have an optical out, these speakers can be hooked up to your TV directly. You can have multiple HDMI devices connected to your TV – such as a streaming device like a FireTV Stick, DTH set-top box etc – and the audio will all be routed through the optical out. You don’t have to deal with complicated mechanisms such as Audio Return Channel (ARC) over HDMI on a Home Theater etc. This puts this speaker set in direct competition with Soundbars that are gaining popularity these days. Speaking of connectivity, Bluetooth would’ve enhanced connectivity even more, since devices such as FireTV Stick have Bluetooth pairing and so do smartphones. It’s more convenient to connect speakers using Bluetooth compared to aux cables. This is not an insurmountable problem and can be overcome by opting for Bluetooth receivers, such as Logitech’s own or more recent ones which also come with optical out, but there’s a cost involved. Other features include an aux-in on the right speaker which means you won’t have to bend down to the subwoofer to quickly connect something via 3.5mm like say a phone. The right satellite unit also features a headphone out. Of the accessories included in the box, apart from a standard aux cable, Logitech has also included a roughly three-foot-long TOSLINK cable – a nice touch. So many inputs, so many possibilities. The variety of sources was simply to get a feel for how different input types would sound on the Z625. The actual scoring was done purely based off of the two most high-end analog and digital sources i.e. the output from the Xonar Essence STX sound card. We ran a whole bunch of our standard high bit rate flacs to test for music performance, as well as various genres of movies and few games such as PUBG and CS:GO. Starting with the music, bass-focussed songs like Massive Attack’s Angel and Chris Rea’s Call On Me sounded quite nice. Right away you’ll notice that this is a bass-head’s speaker. The bass is not boomy but neither is it hard hitting. Still, one this is for sure – there’s a lot of it to go around so most people won’t complain. If you turn the bass dial anywhere over the 60 percent mark it tends to get overpowering straight away. Moving on to some of the more instrument heavy tracks, we noticed that the positioning was very important. Since the satellite speakers are angled slightly upwards, Logitech has already helped in the positioning. Still, you need to ensure that the cone of sound is perfect by trial and error. In other words, listening from the sweet spot greatly improves performance in the mids and highs. As we listened to more tracks, it became apparent that the crunch in the upper mids seems to be missing and the high end, though sounding shrill, lacks finer detail. You’ll get those nice sibilant crashes of cymbals but the richness or sweetness is sometimes lacking in vocals. Overall, I’d classify the sound signature as slightly bright with heavy bass. Movie performance is where these speakers really excel. Explosions, car chases, and those fog horns in movie trailers will sound great. The 7 or 8-inch driver in the sub is fully capable of producing window rattling lows. There is a bit of cabinet reverb but only if you crank it up all the way up. The good thing is with a bit of mucking about in your equalizer settings, coupled with finding the perfect bass level on the Z625’s own bass control, you’ll find that despite the powerful bass the dialogues aren’t muddled either. These speakers are quite suited for motion picture and video entertainment. And since it has so many connectivity options hooking up to multiple sources isn’t going to be a problem either. Incidentally, just for kicks, we tried playing audio over all three of its supported audio sources, and yes, they can be played at the same time. One small problem we noticed was that the headphone out jack which is available on the right speaker isn’t amplified very well. It’s not that big a niggle, just that gamers who don’t have HD audio supported on their front panels might have liked to use the headphone out on the speaker. Speaking of gaming, the Z625 is surprisingly good at stereo separation, so positional accuracy is perfect for casual gameplay (if you are playing competitively you’d anyway go for headphones). Yeah, there's nothing underneath those fancy THX logos. Even figuratively. While we wouldn’t give too much credence to the THX certification, overall it cannot be denied that these speakers do pretty well in the performance department. There are two types of people when it comes to individual preferences for desktop listening – those that like 2.0 bookshelf configurations for their precision and those like don’t mind the accuracy tradeoff for power, low-end bass performance, and value for money. The Logitech Z625 does those three parameters quite well. In addition, you get optical connectivity which is quite useful when you want to connect directly to a TV or gaming console. 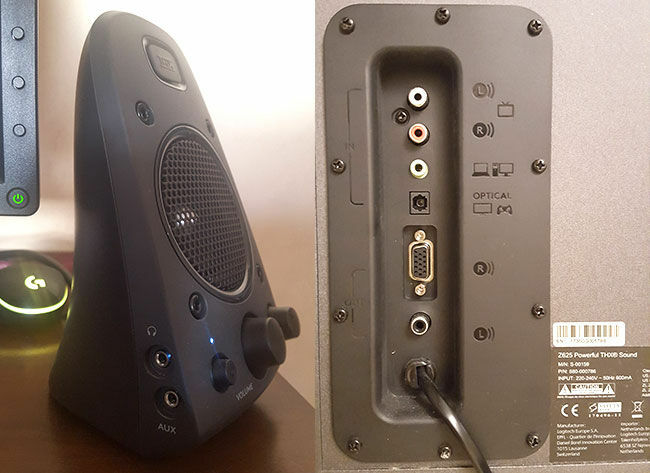 Even if you are not buying the Logitech Z625 as desktop speakers for your PC, with the optical input, they make for good companion speakers for your TV as well. In that respect, the Z625 far outperforms several soundbars in that price range (except the lack of a remote might be a problem with some fixed output TVs). As PC speakers your gaming and movie watching experience will be more than satisfactory – filled with thunderous explosions and roaring rumbles. 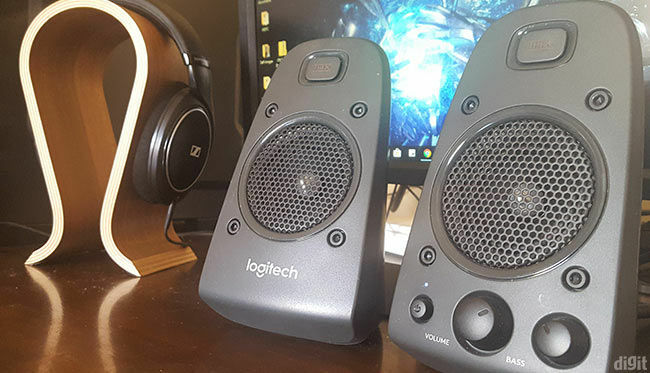 While audiophiles may turn their noses up at the 625’s music performance, most people who know what this price bracket can offer will be more than pleased with the Logitech Z625’s music performance. 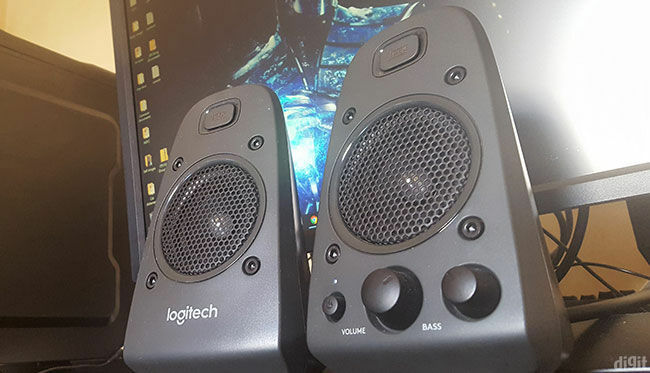 Plus, with an output of 200 Watt RMS, the Logitech Z625 has more than enough power when you need to pump up the volume occasionally for that one-off house party. Simple, but useful features like the 3.5 mm input will ensure your friends can quickly connect their phones if they want to. The only thing lacking with the Z625 is Bluetooth connectivity. The addition of Bluetooth would’ve surely completed the package. The Aux out on the right speaker couldn't properly drive these low impedance Sennheisers for some reason. Since we are now nitpicking, the audio performance while fairly good, could’ve been better in the upper mids. The sparkly signature coupled with the sometimes overpowering bass might not be for everyone. In that case, a less powerful but more accurate system in the same price range such as the Swans M10 might be a better choice. We had the black variant with us a few months ago and those speakers did not disappoint. Now for the buying decision, let us consider the price tag on these speakers. The Logitech Z625 carries a hefty MRP of Rs. 15,995. However, its market price varies anywhere between Rs. 7,500 to Rs. 8,999 depending on which forever-ongoing offer you find and the coupons you are able to apply. At this price point, you won’t go wrong. If you care about bass and need to upgrade from crappy 2.1 speakers to reasonably good ones, these are the speakers for you. Update (14/08/18): While connecting my newly acquired 4K Ultra HD Fire TV, I realised that the speaker is unable to decode Dolby Digital and Dolby Digital Plus. That's a shame. It keeps beeping when the input cannot be played. Several forum posts report this issue. PCM digital audio is still fine of course. 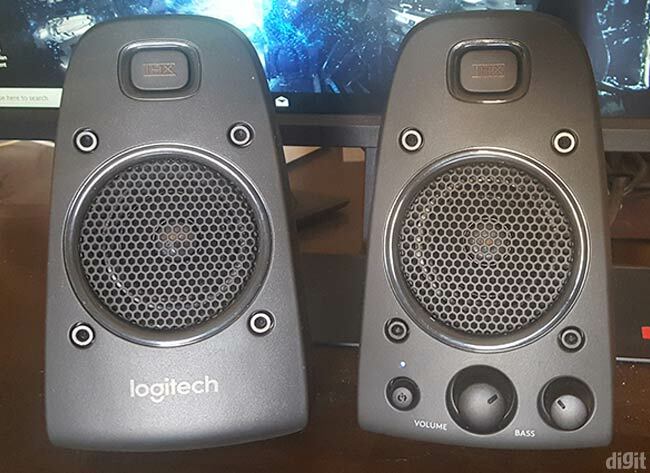 Which speaker is better, JBL flip 2 or Logitech X300? I want to buy a gaming keyboard in india under 3-4K. Any good recommendatios? ?